The following statement about this work comes in retrospect. It is not part of an agenda, social or otherwise, but simply emerges from my own sensibilities. Therefore, the observations are an after-the-fact dialogue. My work comes from a deep-seated place, which integrates a lifetime of experience, thought process, formal artistic concerns and perceptions of other women, whether real or imagined. The color photography reflects the roles women play in society, along with unreal expectations, misconceptions and surrounding myths. The evocative and vulnerable portrayal of the female raises issues about autonomy, stereotypes, equality and self-esteem. Creating dualities in which beauty is offset by an element of fear or discomfort, explores the inner turmoil that is often prevalent in the complex aspects of life. Many of the elements within my photographs come together to form a metaphorical language that draws on the mysterious, dream imagery, distant memories, gut reactions, unspoken fears and amorphous hopes. Vintage treasures and personal momentos create double meanings and hushed dialogue. For instance, traditional objects, which often connote purity, such as veils and bouquets, are slightly altered in order to hint at a greater truth that might be lurking behind assumed customs. 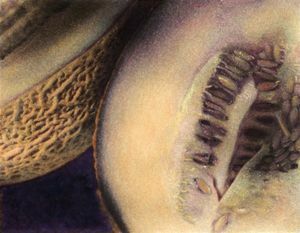 The hand-tinted photographs combine diffusion, grain and texture, with multiple overlays of oils and color pencils. 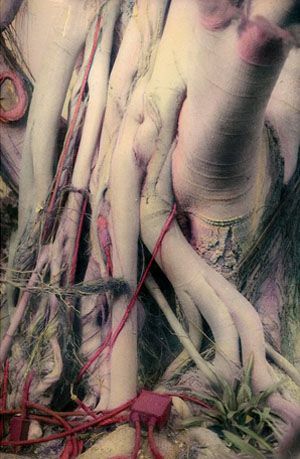 Figuratively, the female form emerges through The Naked Tree Series as well as The Fruits and Vegetable Series. The continuing focus on the feminine, explores issues of vulnerability, sensuality and eroticism. My sense of color comes from my painting palette of fleshy, moody hues, subtle luminosity and monochromatic tones. The subdued colors play against the emotionally charged images, again creating dualities. Soft lighting and minimalist compositions create a quiet mood, which is only a facade for what simmers below the surface. Freyda Miller resides in Los Angeles, where she has worked as a fine art photographer, painter and conceptual artist since 1978. She is a graduate of the UCLA Fine Art Department, with a major in painting, sculpture and graphic arts and an emphasis in fine art photography. For 20 years she used her artistic vision in the field of production styling and coordinating for national print ads and commercials. She provided sets, wardrobe, props, casting and location scouting for national accounts such as: Altoids, ABC TV, Kodak, Mattel, Sheraton Hotels, Sprint and United Airlines. During this time period she continued exhibiting, photographing, painting and incorporating her intuitive skills of collecting and assembling elements to create her personal work. Miller’s consistent focus on the feminine is translated through various mediums of her art, which includes photography, assemblage, painting and hand-tinting photographs that combine diffusion, grain and texture with multiple overlays of oils and color pencils. Miller is a member of Women in Photography International, Woman Made Gallery, Women’s Caucus for Art and LAAA/Gallery 825. She is represented by the Fine Art Division of Corbis Corporation; Art Dimensions, Los Angeles; D & A Fine Art, Studio City; ArtPic, North Hollywood; and McLean Gallery, Malibu. Miller’s work continues to be shown internationally and is in the collections of the St. Louis Museum of Art, New Orleans Museum of Art; The Rijksmuseum, Amsterdam; Tokyo and Fuji Art Museum, Tokyo; Peter Palmquist Archives; Women In Photography International; and UCLA Library, Department of Special Collections.